Innovative school provided a center for once-rural community. Now almost entirely demolished. I'm not sure if this is true, but I heard a that the Lowe family donated that site for 'educational purposes' and there was some fear that legally (deed restrictions)the county may have to give it back if a 'school' were not on the property? I'm a native of that area and attended LGJH across the street. Mr. Robert Lowe, a friendly local gentleman, used to hang around the campus. I always understood that he was one of the last Lowe family members. This would have been in the early 80's. I saw him about 15 yrs ago. Maybe they are scared he would want it back if they tore the school down???? A couple of things . . . first, there are still some Lowe family members in the area. Robert Lowe died in 2003 and is buried in Lowes Grove Baptist Cemetery across the street. His headstone says, "A friend to all". I remember him "directing" the schoolbuses as they pulled out of the driveway, newspaper tucked under his arm and his bag lunch sitting on the ground next to him. Second, Lowes Grove Elementary was in use well into the 80s. Parkwood Elem never had a 6th grade, so all P'wood students attended LGE for 6th grade before going on to LGJH across the street. The Little Red School House was already at LGJH when I was there 1982-1985. I believe it was used for special ed. What is referred to as the elem school at Lowes Grove was actually the 5th and 6th grade building in the later years. There were about 4 classrooms upstairs along with a balcony to the auditorium, with half the seats broken! It was heated by radiators, so the only way to control the heat in the winter was to open and close the windows. The next building south was the library and the next one was the administration bldg, I believe. Charles Guess was the principal in the late 70s and early 80s. Ms Small, the librarian, still works the polls at Pearsontown Elem, I see her at every election. In the early 80s, LG hosted the school for autistic children, and the 6th graders worked with them on a regular basis. A wonderful experience. It was very sad that the buildings were deemed un-salvagable. I hope something can be done to save the last building. The new library is OK, ALWAYS packed with people, but I miss the familiarity, coziness, and smell of the old Parkwood library that I grew up with. Also, FYI, there is an historical marker near the site of the new credit union saying that it was the site of the very first state credit union. There is no "new" Lowes Grove Elem, just Lowes Grove Jr High, which is now Lowes Grove Middle School. Lowes Grove Elem simply closed and students were districted into other schools. 1989 sounds about right for when the elem school closed. It may have looked "creepy" and desolate, but it was definitely operating until late 80s. Before LGJH opened in Fall 76, the "elementary" school went through 9th grade. Then they went on to either Jordan or Southern. Later, some elem students actually went to Githens afterwards, b/c they lived down Hwy 54 near Chapel Hill. It also housed the 5th and 6th grade gifted-and-talented program, so there may have been students there from other elementary schools. I believe the Little Red Schoolhouse was still on the elem school site during the 81-82 school year, but was moved to LGJH in the next couple of years. That's correct! My 8th grade class was first to start there in 1976. I didn't realize (or had forgotten) there was a 5th and 6th grade gifted-and-talented program and I guess I didn't realize the old very run down bldg was occupied. Sorry for the excessive posts from me but it just struck a note. Can't wait to hear about Bethesda...hint. Thank You! I went in the buildings several times after its closure and the condition of the buildings was awful. It was an excellent example of demolition by neglect, if there is such a thing as an excellent example. All buildings had roof problems, which caused massive structural problems as the floors and joists slowly began rotting away. Several of the smaller buildings on the south end of campus had basements or similar rooms, some with boilers, etc. All of them were full of water. The local homeless population had begun using the main building as a drinking/ sleeping facility. Certainly better use could have been made of the exiting buildings, but I'd much rather see a library present than another fast food place or mega drugstore. Great write-up as usual! This abandoned school is what got me interested in local history when I came across it after moving to the area a few years ago. It was such a beautiful edifice left to rot! I grew up in a freshly-built, history-sanitized suburb, and so it immediately caught my attention. These buildings were in very bad shape as Dave said. I attempted to price stabilizing the buildings to prevent further decay around 2003, but determined they (a community group trying to save the school) didn't have enough budgeted to continue with that endeavour. Most of the buildings, including the one that was left are wood framed with brick veneer. Because of roof leaks the wood framing was rotting. In the large building there are sections of wood subflooring in hallways that are being held in place by the carpet and the carpet is being held by the baseboards. To walk down the first floor hall you have to walk over a network of boards laid on the few joists that aren't rotten. The smaller buildings had trees growing in them and one had fire damage. All basements were flooded. Sad that none of the original 4 schools are existing any longer - Oak Grove, Lowes Grove, Hope Valley and Bethesda. My oldest sister was a senior at Oak Grove but "officially" graduated from Lowes Grove because she got married in the middle of her Senior Year. The rest of us went to Oak Grove and graduated from Southern. I went to Lowes Grove Elementary for my 6th grade year, then over to LGJH. I was the last 9th grade class to graduate LGJH before it became a middle school. I remember walking past the little red school house, I think there was a black top near it where we used to play dodge ball. I also remember classes in the large building that they have yet to tear down. I really think it should stay. Revitalize it, restore it. It's history. To many times we erase it for the new and modern. I like the old and historic myself. There are stories in those walls, don't tear them down. I was at Lowe's Grove for 6th grade in 84-85 and the little red schoolhouse was used as the library. This site is very interesting and informative, some places I have always wondered about and others hadnt ever noticed, thank you! I didnt read all the comments but wanted to agree with your comment about better placement of the new library - which I was not a fan of them moving! It was a community library when I worked there, inside Parkwood, not so much anymore. Oh well, guess that's what they call progress. I had also heard the 'rumor' that the land which LGE stood was donated or gifted with the specific purpose of serving the community, so education, sports, parks, library all would count - the bank, my family wondered if the stipulation of the gift had run out, so to say. So perhaps that was part of why they let everything deteriorate so bad? On another note, I was very disappointed to see the placement of the new building and there was another case of lack of interest in history at NCCU - they took over the old Hillside HS, which had a beautiful facade which was destroyed to build new buildings for the university. It seems in Durham the destruction of our history is just a side effect of progress... It tears me up to watch it. Great site! Lowes Grove was my first and only elementary school, as it was for several of my siblings. I believe my first year there was in 1959. At one time or another, I was in every building there for classes of some sort for 1st through 7th grade before attending Githens, and even had Cub Scouts in the old red school house! I fondly recall Roberts' visits on the bus after school, dodge ball next to the old school house, scouring the library for science books, my first band classes in the old gym that sat behind the main circle, being chased by the school bullies, "harvesting" sassafras, and notably, witnessing President Kennedy's passage enroute to Chapel Hill and later, in almost exactly the same location, first hearing of Kennedy's assassination while playing softball on the ball field. I attended Lowe's Grove elementary for 5th grade, the last year the school was to have 6th grade. The year I left the school, both graduating 5th & 6th graders were to attend Lowe's Grove Middle School the following year.The year would have been 1988. I know that the following school was also to have had a full k through 5 class. That would have been 1989. Past that, I don't know what happened. While I attended in 1988, the Little Red School house was being used for special ed. The library was to it's right (facing the school), followed by the administration building, and all the way to the right and across the courtyard from the main building was where 6th grade and art & music were located. Mr Guess was still principal, Ms Small in the library, and the art teacher I remember had really long red hair, though I don't remember her name. Mrs. Beeson was one of the teachers, also Mrs. Parrish, Mrs. Hockaday , and Mrs. Strawberry I think for music. Anyone else remember more teachers? Thank you for the wonderful info you have here! Oh! I almost forgot...I remember the big windows in the picture above of the 1910's too...the long tables in the classroom at the time butted up against them, and it was the biggest thrill to get to take naptime with your mat laying on one of the tables. I remember counting to 100 for the first time laying there on my tummy with my chin on my hands staring outside. And believe it or not, I first learned to use chopsticks at Lowe's Grove too! I think it was my 1st grade teacher who taught us, with bowls of rice of all things. Ooooh...and the big chalk boards on wheels in the classroom...I remember getting in trouble and having to stand behind one after getting spanked once. Those were the days! Hehehe! 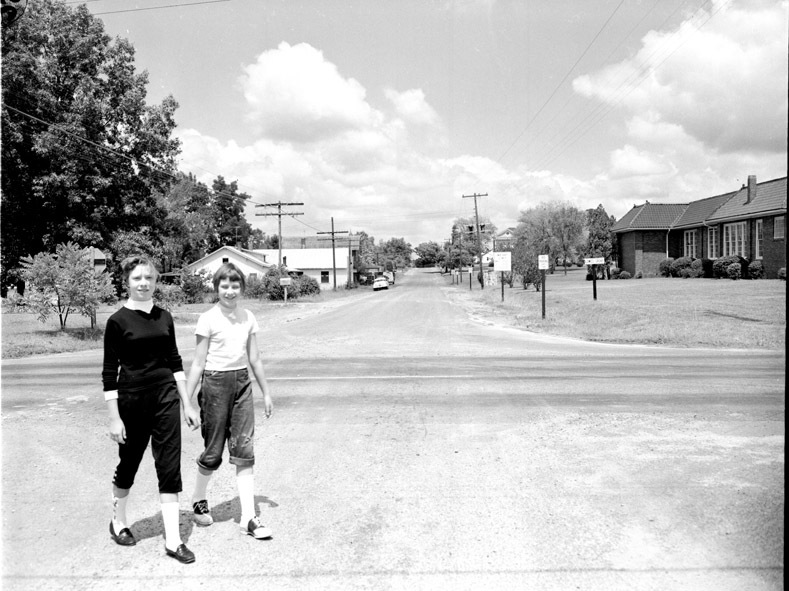 The two girls standing in the intersection are the Arnold girls. They lived in the Katie Morgan house that was razed by the widening of the SE corner of Alston Ave next to the current location of Hardees. I'm pretty certain the one with the hormones was Mary Fances and the younger girl her sister Lydia. I'm guessing 1957.The last time I talked with Mary Frances she was living in California and had a personal trainer. I was in the Little Red School House in the 4th grade. Then it was painted white and had a pot bellied stove. My 7th grade glass was in the Ag Building. It also had a coal burning stove. We got to school before the teachers because of the bus schedules. We would heat the poker red hot and burn holes in the floor with it. 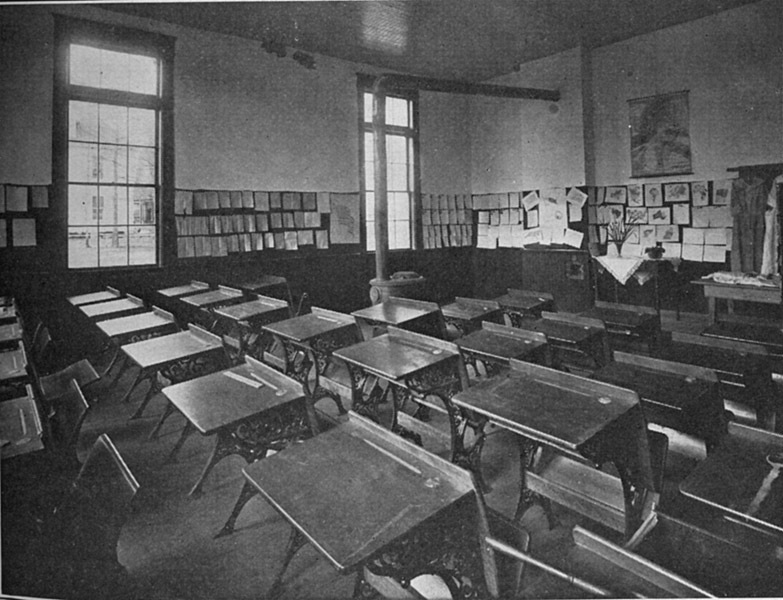 I believe the photo of the class room identified as 1910 was the same classroom. It's a shame the racially motivated school board let that campus become the awful eyesore it was. They could at least bull dozed it rather than letting it fall down. I went to LGE from 81-87, so the entire K-6th grade. LGJH didnt change to middle school till i was making the tranfer from elementry to jr high.I later moved to a small community area called Folkstone which later and now backs up against woodcroft. I remember the teachers mentioned in one of the post. My 1st grade teacher was Ms. Young. I had a crush on heras well..lol. The building we were in had the teachers conference room and i remember making copies with the copy machine using the carbon paperwith the hand crank. To me was a since of community while i was there. Didn't help that my dad knew Mr.Guess, who was a medium build man with his wire frame glasses and the thick aroma of old spice would follow him as he went past you. One other teacher there that had a hair style like hulk hogan...lol that's how i remembered him. Talk about if i got in trouble my dad knew it with in 10-15 mins..Geez...The start of the day during that time was the pledge of alleiance and my country tis of thee(America). I remember the red school house building as you couldn't miss it out of all the building with it's red color. It was ther the entire time i was there but i do remember them saying something about moving it later on. I think it was in the paper whe the finially moved it and they were mentioning the age of the school house. To the right of it was the blacktop where many of dodgeball was played. Behind the red house was a small blacktop where there was tetherball. Behind the Kindergarden/cafateria building were the swings, slides and monkey bars. I remember one day tring to balnce myself on a rolling culvert like they do in the circus. Bad idea as it rolled on me. Things we do as kids.lol. I remember the days of Kite day, relay races, snakes alive, Making banners for the UNC tarheels basketball team as they traveled to play in the NCAA turnament and wait to wave to them as there bus passed by and other activities throughout the year. Well as you went up in grade the buildings in the middle were the lower grade K-2if i can remember. 3rd - 5th grade were the building to the right closest to where the school entry was and 6th grade was the far right which was was to the left of the old red school house. Something about that building appealed to me. It's old lacquered floors as they echoed as you ran up tje steps to your next class. The radiators as they popped and cracked as they were heating up the room hotter than you wanted it to be. James the old janitor whistling a tune(i pulled his name out of nowhere)as he cleaned the halls. Last teacher i had at the school was Ms. Jenkens. Go up the stairs take a right, Last room on the right.....I'm rambling like my grandpops but elementry school brings back some memories of good time of back when life and living were better compared to now. Great write up. I went to Lowes Grove Elementary when it was K-7th. Then on to Githens. I remember Ms. Elsie Painter, taught 6th grade and a wonderful teacher. I also remember a teacher who taught seventh I think. I remember that she used to bang a paperweight, with flowers/shells on the inside, when she couldn't get our attention. I also remember that she threw it at a student one day when she got mad. She was a riot. Remember 6th grade being downstairs and 7th upstairs. There was a male teacher in 7th that was so handsome and I hoped to get him...but didn't. Also remember field days, the cafeteria staff, and the ball field. Wonderful times. Wonder what happened to Ms.Painter???? I loved her so much. She inspired me to become an educator. wow i cant believe how my school used to be it used to be small and elementary school bu now is a middle schol and this school is a great school they learn i mean we learn how to keep our selfs together. Text in italics below is from the Durham County historic inventory. Shortly after Durham County was formed in 1881, a rural community named for descendants of Stephen Lowe, a bricklayer who had come to Wake County in the 1770s, grew up in its southeastern sector. In 1889, Lowe’s grandson, Edmund, and his wife, Patsy, were instrumental in organizing informal church services held at the Lowe’s farm because Patsy was partially paralyzed. A small group of people met first in the house but later found a farm building in a nearby grove of trees more to their liking. The community subsequently took its name, Lowe’s Grove, from their meeting place. In 1896 a one-room log and frame school building was brought on rolling logs pulled by mules from the Nelson community several miles away. This building, called the Little Red Schoolhouse, was replaced in 1903 by a more substantial structure, also known as the Little Red Schoolhouse, which [stood] near the north end of the Lowe’s Grove campus. 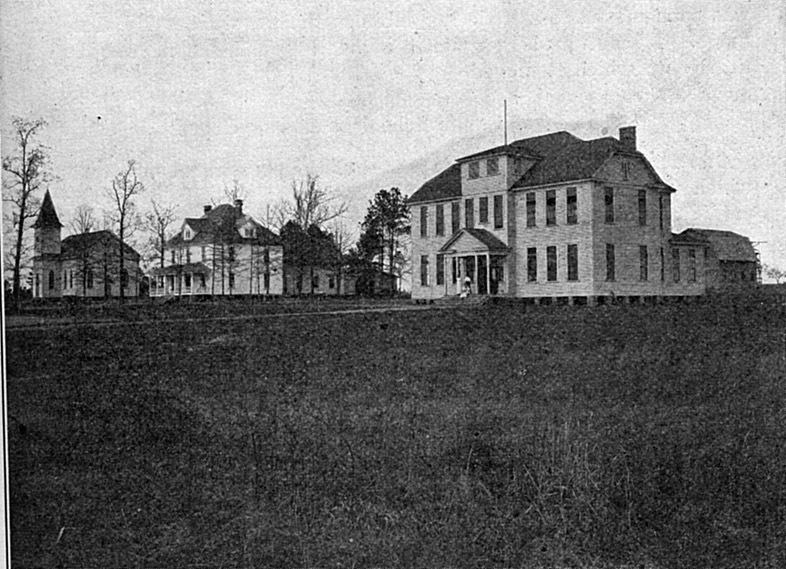 The community voted for an extra tax to improve the facilities and a larger building with three classrooms, an auditorium, and a library was added in 1910. 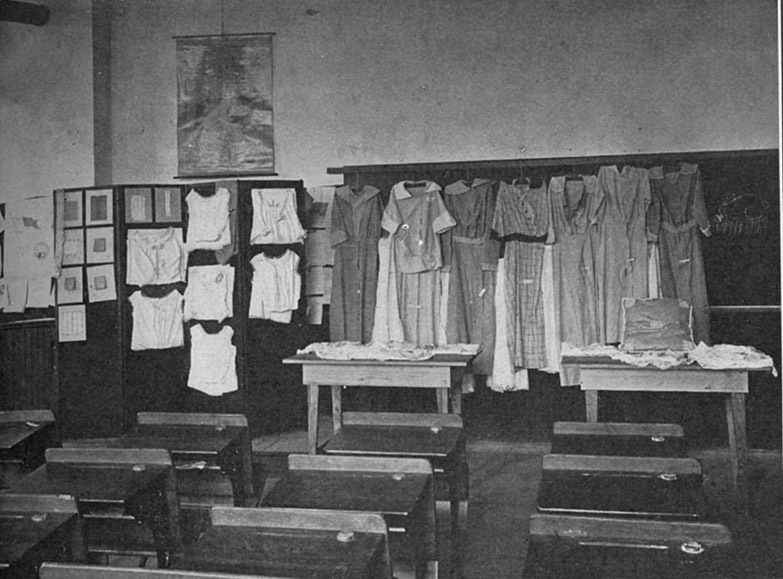 Classroom, Lowe's Grove School, 1910s. In 1913, the state legislature passed the Farm Life Bill, setting aside $2500 for “expert instruction in domestic science and agriculture.” A period of six months was then fixed by law as the minimum annual schooling period. The Lowe’s Grove School, already on a nine-month schedule, was one of two schools to receive a farm life grant from the state of North Carolina. The campus was expanded and a demonstration farm begun at the school to teach students practical farming technology and farm and household management as well as mathematics, Latin, history, physics, chemistry, and English. In 1922, when two hundred students were enrolled at the school and it received national publicity in Colliers Magazine, extensive renovations were made to the 1910 structure and construction of three additional buildings was undertaken. 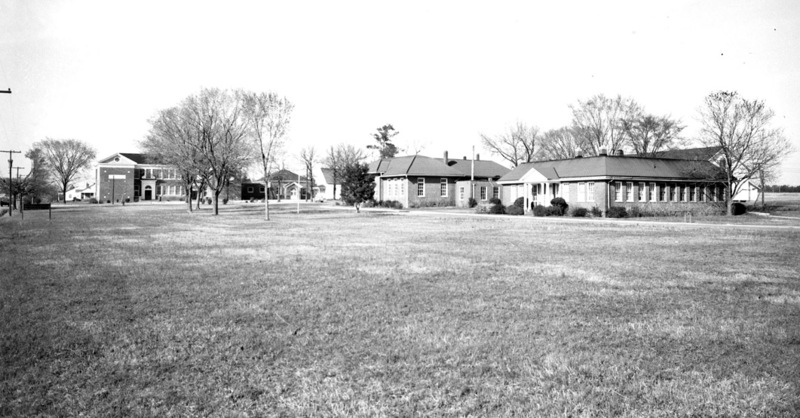 Completed by 1925, these four buildings made up Durham County's first all-brick school complex. Six handsome buildings [bordered] a curved drive at the edge of a spacious lawn. At the north end, a south facing, brick, two-story, Colonial Revival structure with a gable roof and projecting end bays, dominat[ed] the campus. Its central block is enhanced by a pair of symmetrical neoclassical entrances framed with Doric pilasters carrying full entablatures. Designed by the Durham architecture firm of Rose and Rose, this building was added to the complex in 1928 as an elementary school. A large rectangular brick cafeteria wing with a pyramid roof was joined to its east elevation ca. 1960. Immediately south and set back from the drive beneath large oak trees [was] the Little Red Schoolhouse, a frame, one-room, gable-front structure with an attached hip-roofed porch. South of it, the four brick farm life school buildings [bordered] the drive; they [were] one-story Spanish eclectic-style structures with hip and mansard roofs. The northernmost, the renovated 1910 building, served as the grammar school. [Later] a large T-shaped structure with a hip and mansard roof of metal tiles, it ha[d] a projecting central entry pavilion ornamented with diamond-shaped tile insets. Next to it a rectangular structure with an asphalt shingle mansard roof and a neoclassical entry portico was the home economics building. Beside it, a small and plain rectangular building with a high mansard roof of metal tile was the vocational agriculture building. At the far south of the complex, the high school, a large one-story T-shaped building with a metal tile mansard roof and a prominent central entry bay divided by four pilasters, face[d] the elementary school across the campus. Except that windows and doors throughout the complex are replacements and the roof of the home economics building ha[d] been covered with asphalt shingles, most original architectural details ha[d] been preserved [as of 1990], and the Lowe’s Grove School [was] an outstanding example of an all- grade public school that dates primarily from the 1920s. When the campus was closed in 1989 and its functions moved to a modern facility across the road, the Little Red Schoolhouse was among the oldest continually operated school buildings in North Carolina. The buildings of the old school were abandoned in 1989; sometime between 1993 and 1998, the Little Red Schoolhouse was moved across South Alston to be adjacent to the modern Lowe's Grove Elementary School. After deteriorating for ~15 years, the county purchased the 16 acre property from DPS for $1 million in April of 2004, stating their intention to demolish the building to build a new regional library. The city was originally to share the cost with the county and use some of the acreage for a new city park. However, the cost was deemed too high, and a move by some of the community to try to save the buildings dissuaded the city from participating. The county was not persuaded to retain the majority of the buildings of the Lowes Grove school by the community; I'm not sure exactly when all of the buildings except for the large building, but it was likely in ~May of 2006. When I went to photograph the site in October of 2007, all that remained was the elementary school building, the drive, and the entry to the drive off of South Alston. The County started construction of their new fancy 'green' Freelon-designed library on the site in ~2008. Bird's Eye view of the site being graded for the regional library. The old elementary school building is still standing, but deteriorating badly. I'm not sure if they have any intention of renovating this building, or just letting it get bad enough that they're 'forced' to tear it down. As would be expected, I think the county should have and could have preserved the Lowe's Grove campus. They'd claim it was too expensive, too far gone, etc., but there simply isn't the commitment to historic preservation at the county level that encourages anyone to make the effort to think creatively about how to accomplish more than one thing with a capital improvement program. See justice center, human services building, etc. Everything has one purpose, and opportunities to leverage improvements in such a way to create positive externalities, economic development, etc. are ignored. Although I'm just generally not a fan of Freelon buildings, I like the regional libraries, and particularly think the interior experience is nice (I've only been in this one and the East Regional.) If they do have some intention to save the still-standing elementary school building, the site planning is just dumb. Why hide the beautiful facade of that building behind this one? The opportunity to build something that transitions from the historic to the modern elegantly, rather than just plopping it down in front of the old building, was wasted. I'm particularly not a fan of the cloying attempt to 'embrace' the history of Lowe's Grove through little exhibits and inlaid timelines in the lobby. Like the breathless self-congratulatory bs of touting a 'sustainable' building - after demolishing 5, it seems like a cynical attempt to gloss over the reality - which is that our and future generations' ability to experience the history of this place has been irretrievably damaged, and it will take at least a generation for the energy savings of this building to offset the energy wasted by demolishing the existing buildings. I can at least respect when people simply and honestly don't care - they want their modern fancy building, and they want to get rid of the ugly old ones. I disagree, but sometimes that's just how it is. But pretending it's historical and and the save-the-planet choice is just insulting. That's exactly what I recall. A couple of things .